Those loyal to Prezi Classic will be pleased to know the software is still available in the account and both the new and old can still be used. 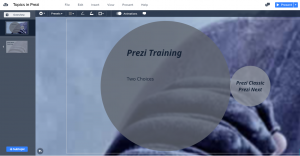 The major change and improvement in Prezi Next are Topics – previously you’d add a new frame in Prezi Classic but now you add a new topic which is represented by a circle named a cover containing text which can be customised and other topics added including different content such as images, text and more subtopics. Topics come in two flavours Planet and Stack – in planet you create the topic with the subtopics surrounding it. Its looks a little like a planet with satellite planets surrounding it whilst as its title suggests the Stack topic gives a more stacked or layered view with the previous slide fading away and the new one taking its place. This is what was said about the Prezi Training. Greta was approachable and made learning the software easy using simple steps. Her early response and communications prior to the Prezi course were much appreciated. Why not drop me an email at info@gretapowell.com or via the contact page above for an informal chat about your Prezi Training. It’s brought direct to you delivered onsite at dates and times to suit you. This is onsite Prezi Training across the UK held in all major cities including Nottingham, Leicester, Derby, Birmingham, Oxford, Liverpool, London, Lincoln, Leeds, Sheffield and all surrounding areas.